The Hall of Languages glows red during a previous Orange Goes Red campaign. 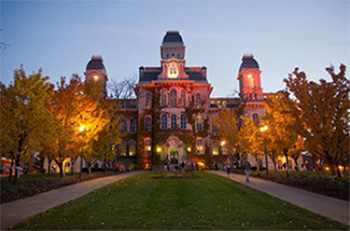 The Hall of Languages and Hendricks Chapel will be aglow in red lights on the evenings of Thursday, Feb. 2, and Friday, Feb. 3, as part of the campus’s Orange Goes Red for the American Heart Association (AHA) campaign. Friday marks the 13th anniversary of the AHA’s Go Red for Women campaign, and is also National Wear Red Day. A landmark study in 2003 revealed that heart disease was the number one killer of women. To save lives and raise awareness of this serious issue, the AHA launched Go Red for Women. The red dress has since become the iconic symbol of the battle against heart disease in women. National Wear Red Day—the first Friday in February—brings attention to cardiovascular disease in women by encouraging everyone to wear red and take positive action to live longer, healthier lives. Some form of cardiovascular disease affects more than one in every three adult Americans. Many suffer terribly from disabilities caused by these diseases.